1.1 Upon signing this agreement, the Party Host agrees to pay a reservation fee of Php20,000.00 payable to DMCI-PDI. 1.2 Fifty percent (50%) shall be made by the Party Host Thirty (30) days after the reservation. 1.3 Fifty percent (50%) balance must be settled Thirty (30) days before the event. 1.4 For events booked less than Two (2) weeks before the scheduled event, full payment and security deposit is required Five (5) days before the event and shall be settled in cash basis only. 1.5 Reservation fees and all other payments made shall be forfeited for cancelled reservations and “No- Show” cases. 1.6 Rebooking of events is allowed depending on the availability of the venue place. However, rebooking is only valid for One (1) year from the first reservation made, otherwise, reservation fees and other payments made shall be forfeited. 2.1 Security deposit of Php30,000.00 must be lodged Thirty (30) days before the event. 2.2 Security deposit will be refunded less charges, if there is any, Thirty (30) days after the event date. Photocopy of ID and authorization letter must be submitted before the event as main requirements for security deposit Refund. 2.3 Party Host must provide an authorization letter for Ms. Manilyn Anore to pick up check refund from DMCI HOMES Head Office with photocopy of signatory’s identification card. 2.4 Any penalties or incurred fees will be deducted from the security deposit. 2.5 Damages/penalties that will exceed the security deposit will be charged accordingly. 3.4	Guests are not allowed to loiter at the other halls. Violation of this section will be penalized for Php300.00/guest. 3.5	No smoking inside the tent. Smoking areas are assigned only at areas with designated bins. 3.7	The Party Host shall be liable for damage he/she or his/her guests or suppliers has caused the venue and its facilities including accessories found therein, and for any injury to the person/s or adjacent properties. 3.8	The Party Host shall be responsible for the safety and security of his/her guests, their personal belongings and properties brought into the premise. The Tent Management will not be liable for any loss of personal belongings within the premises. 3.9	The Party Host shall be responsible for the conduct of his/her guests at all times. He/she shall see to it that there will be no disturbing activities such as loud / offensive music and boisterous actions. 3.10 No wll and ceiling posting, may it be in tarpaulin, posters or of any form. For decorations and other special arrangements, a proposal/plan must be submitted One (1) month before the event for The Tent Management’s approval. 4.1	Caterers shall provide trash bins/bags. Garbage disposal after event must be directed at Town Center Acacia Estates garbage disposal area and must not be left at any part of The Tent. Violation of this section will be charged Php2,000.00. 4.2	DMCI Leasing Services Department/The Tent Management is not liable with your contract / negotiation with Party Host’s third party suppliers i.e., caterers, lights & sounds, photo booth, etc. 4.3	No vehicle is allowed to enter the promenade. 5.1	Ingress is Four (4) Hours before the main event. 5.2	Egress is Four (4) Hour after the main event. 6.2	No parking on the side streets of Acacia Estates and sides of Town Center. Violation of this section will be fined at Php500.00 per vehicle. 7.1	Leasing Coordinator will be available on the date of event to coordinate and supervise the entire activity and ensure that The Tent house rules are well implemented. 7.2	Leasing Coordinator will be requesting Party Host to sign The Tent Clearance Form after egress. This will be used as reference for the refund of security deposit. The Tent Management will inform Party Host of venue damages and suppliers’ and guests’ violations, Twenty-four (24) hours after the event. 7.4	Party Host will be in charged for the food of the following staffs provided at The Tent: (1) Leasing Coordinators, (1) Electrician, (3) Housekeepers. 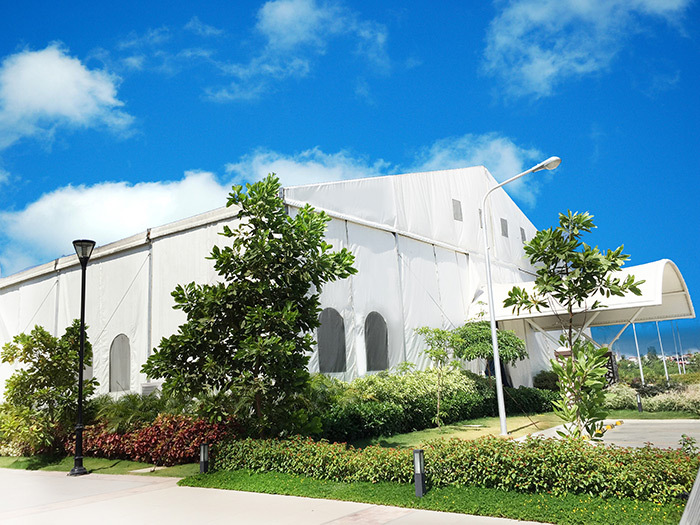 DMCI Leasing Services Department / The Tent Management shall have the exclusive prerogative to remove, disallow or discontinue the use of the Venue if the Lessee does not comply with The Tent’s rules and regulations.